Performance Time: Approximately 60 minutes, 57 pgs. COMEDY. “Committed man looking for a wife. Needs to be a little boring and willing to be engaged in one day.” Tired of his parents treating him like a loser because he isn’t married, Dietrich tells them he is engaged. 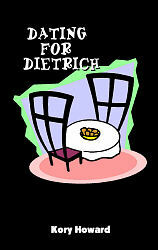 Overjoyed, Dietrich’s parents make plans to visit him to meet his new fiancée on his birthday, which is just two days away. With just two days to find a potential wife for a nerdy guy who loves math, crossword puzzles, and solving the daily Jumble, Dietrich’s two best friends put an advertisement in the paper and agree to date some potential brides for him including a Goth cheerleader, an accident-prone klutz, and a woman on the run for murdering her last boyfriend!